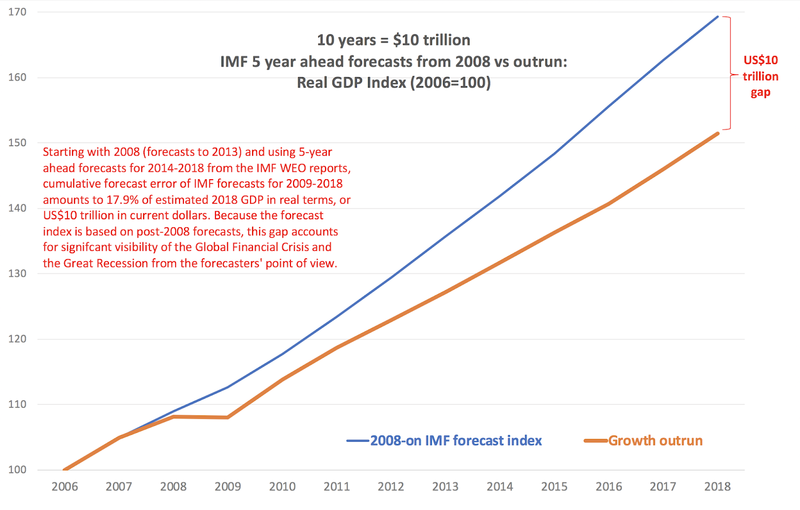 A recent MarketWatch post by Ashoka Mody, @AshokaMody, detailing the absurdities of the IMF growth forecasts is a great read (see https://www.marketwatch.com/story/the-imf-is-still-too-optimistic-about-global-growth-and-thats-bad-news-for-investors-2018-10-15?mod=mw_share_twitter). Mody's explanation for the IMF forecasters' failures is also spot on, linking these errors to the Fund's staunch desire not to see the declining productivity growth rates (aka, supply side secular stagnation). 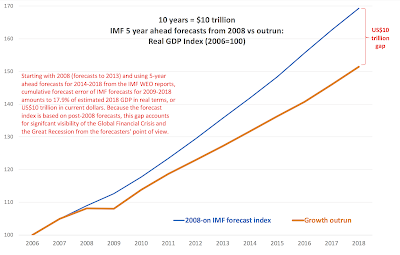 While the first chart simply plots IMF forecasting errors, the second chart paints the picture fully consistent with Mody's analysis: the IMF forecasts have missed global economic activity by a whooping cumulative USD10 trillion or full 1/8th of the size of the global economy, between 2008 and 2018. These errors did not occur because of the Global Financial Crisis and the high degree of uncertainty associated with it. Firstly, the forecasting errors relating to the GFC have occurred during the period when the crisis extent was becoming more visible. Secondly, post GFC, the hit rates of IMF forecasts have deteriorated even more than during the GFC. 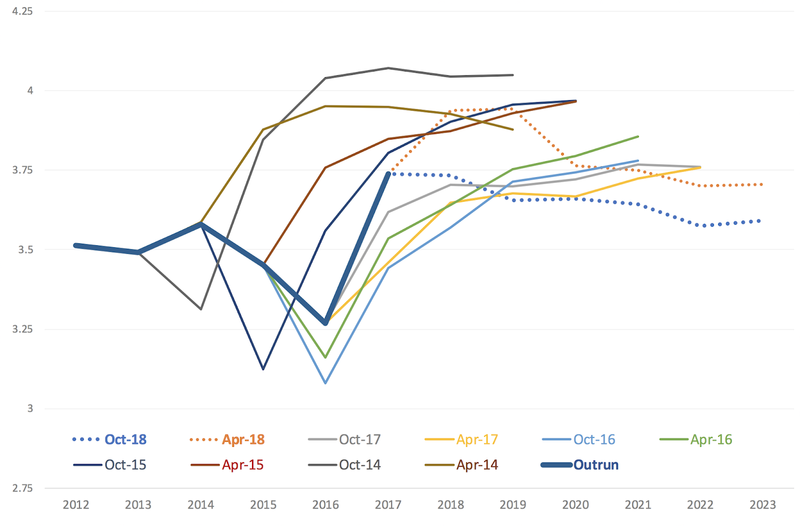 As Mody correctly points out, Fund's forecasts got progressively more and more detached from reality. 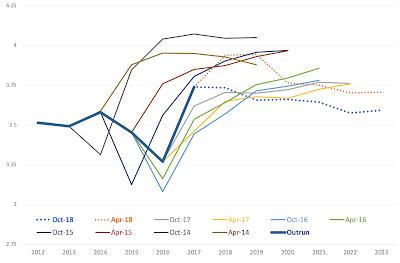 At this stage, looking at April and October 2018 forecasts from the Fund's WEO updates implies virtually zero credibility in the core IMF's thesis of a 'soft landing' for the global economy over 2019-2021 time horizon. 26/10/18: De-democratization of our values?